This is the day kids really start dancing. After spending all of day one in various stages of disequilibrium, day two brings an integration of new skills. If day one was about "Oh my gosh, look what we get to do!" day two is about "Oh my gosh, look what I can do now!" and "Look what we can make!" This is also the day we focus on sameness. As in, how can we make our dancing the same as our partner's dancing? What exactly needs to be the same? Me, to different teams of students working on their four-beat Pattern A: "Is that a jump or a slide?" Me, during our periodic active observations of work in progress: "Are they turning the same direction or opposite directions? How can you tell?" Me, to dancers: "Are your feet split to the sides or is that a diagonal split?" or "How does it feel to finish with your feet crossed?" Today I spend a lot of time roving around the room just observing. At the beginning of creating their four-beat Pattern A, their feet and physical intention still emerging. They have to organize and integrate the ideas they see in their heads and communicate it with their bodies. They also have to sync up with their partner's dancing as well. This is a fantastic, engrossing challenge. It is also fascinating to watch their dancing/moving/body voices emerging so spectacularly over the course of the hour. As the class proceeds, they all want to show me what they've come up with. We talk. When I show up near them again, the pattern looks different than I remember. "Oh, you changed it!" I exclaim. "Yeah, we like it better this way," they grin, proud of their agency and resourcefulness. Their dancing is cleaner now too. 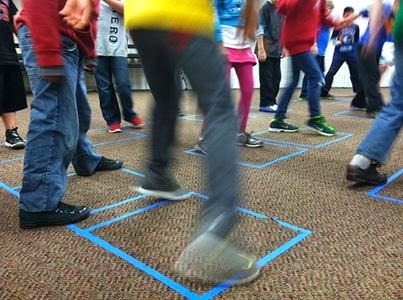 Teammates discuss the similarities, sameness and differences of their (blue, taped, square) dance spaces. In one class, children noticed: "They both have four corners" and "They have four parallel lines." Me: "Are there really four parallel lines?" Discussion ensues. At one point, a boy lifts his hands and, without speaking, uses his fingers to trace two parallel lines vertically in the air, and then two parallel lines horizontally. Me: "Good! So by that I think you mean there are two sets of parallel lines?" He nods. 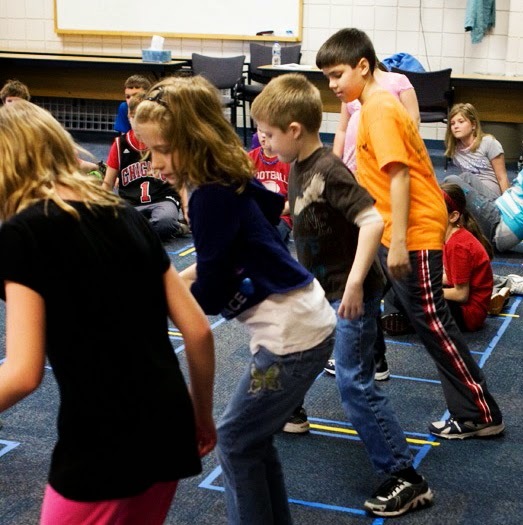 I say, "Okay, let's all trace those lines in the air..."
The work we do in teams of two to choreograph math-informed, math-infused percussive dance patterns is social learning. Not only do ideas flow verbally and physically between student teams, but also within each class; the energy in the room while kids are making often resembles a beehive. Today, for example, about half way through my most challenging class, something clicked and everyone was working intently; I could literally feel the group working and thinking together on their individual projects.